You have invested considerable time and resources in building your internal business systems. 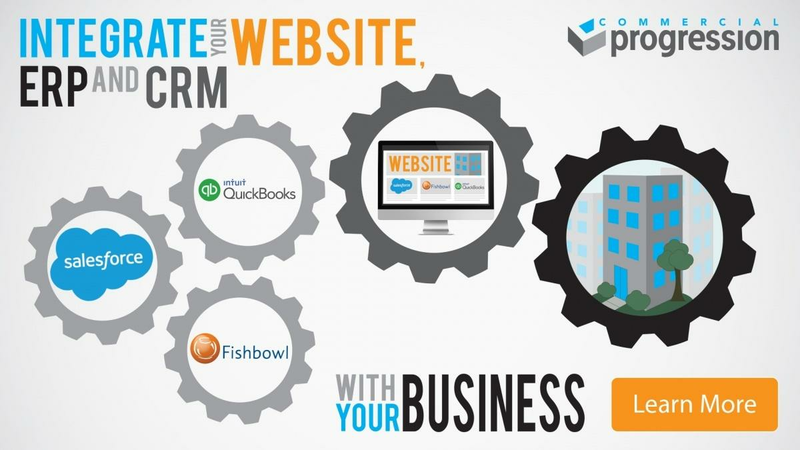 It is time to connect these systems to your front facing website and leverage your company's back office data online. The full utility of your web presence requires that your website integrate with other key business systems for marketing automation, customer relationship management (CRM), enterprise resource management (ERP), product lifecycle management (PLM), and invoicing / billing systems. Commercial Progression can perform integrations between the Drupal open source CMS and any back office data system. When this is done, your website becomes a true extension of your business. Your inventory management systems are bridged to online product pages and automatically stay up to date as internal inventory systems (QuickBooks & Fishbowl) are updated. Lead generation forms intelligently update your Salesforce CRM and log customer leads for immediate follow up. Marketing automation systems (Hubspot, Marketo, Acquia Lift) are integrated with your website to personalize landing pages, copy, and graphics to match buyer personas. Email campaign tools (Constant Contact, Mailchimp, Vertical Response, etc...) are linked to your lead generation forms for automatic newsletter and drip campaign signup. Distributor locators are built on top of intelligent mapping systems and linked to your databases for easy updates. Contact us for a free evaluation of your website integration needs and discover how we can build a unified business for you.